The brackets for the Round of 16 in the Champions League are out and everyone’s worst fears – well, the worst fears of Arsenal fans, at the very least – have come to fruition and the Gunners will once again face Bayern Munich. 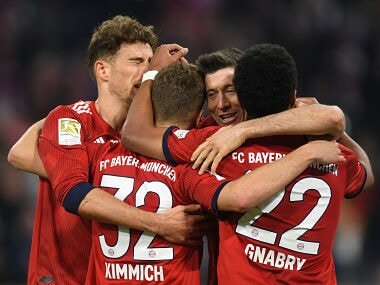 That's right Bayern-stinkin'-Munich for the third time at this stage in five years and for the fourth time in this competition — the Bavarians were in the same group as the North Londoners — over the same period. For Arsenal, this is a chance to live up to its much-vaunted bench strength, to which a reference has been made at nearly every stage of the season — by the media as well as the team and its manager. In fact, Arsène Wenger has attempted to demonstrate this bench strength by putting out significantly different teams for Premier League and Champions League games (not to mention a completely different starting XI for the EFL Cup fixtures.) And apparently, it's been this mixing and matching and shuffling of lineups that has helped Arsenal top its Champions League group for the first time in five seasons and hang onto the second place on the Premier League table after 15 games. But are Arsenal's achievements really due to its bench strength? It must be borne in mind that the Premier League segment of this table is a snapshot of Arsenal's position after 15 games, which is roughly the time the group stage of the Champions League wraps up. And while in this time frame, the club has never finished the season below fourth place — an achievement that is roundly mocked, but has yet to be achieved by its rivals – a look at how the club is faring 15 games in, is instructive. But first, some sort of explanation as to why I'm going with that figure of 15 games is required. On one hand, 15 games is a decent sample size that gives some indication as to which way a team's fortunes are going. And on the other, it's roughly around this point that the group stage of the Champions League comes to a close. 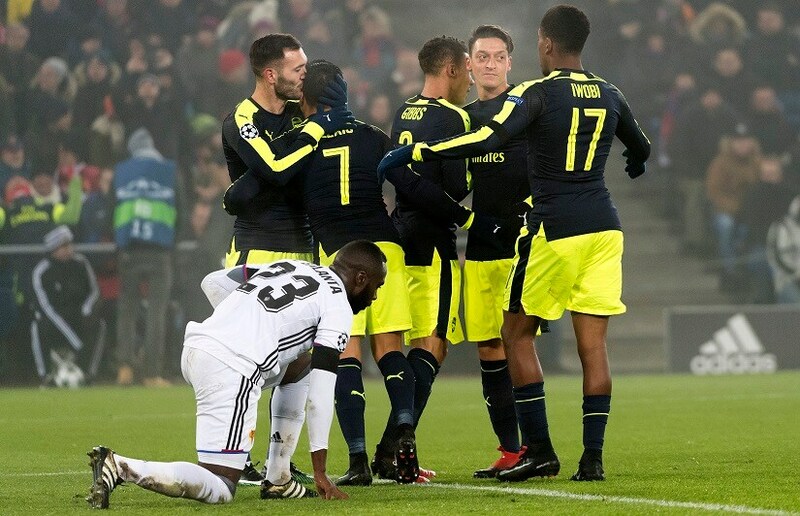 And the last time since the ongoing season — wherein the team's only non-victories were the two draws against Paris St Germain — Arsenal went unbeaten in the Champions League group stage was in the 2005-06 edition, which astute readers may recall ended in a heartbreaking loss to Barcelona in the final at the Stade de France. Back then, the Arsenal team comprised the likes of Thierry Henry, Dennis Bergkamp (in his final season), Robert Pires and Sol Campbell in the outfield with Jens Lehmann between the sticks. But as one quick glance at the table above will show you, despite this fantastic lineup, the team's position on the league table at this stage was a lowly sixth, with Arsenal ending the season in fourth place. This time however, while topping Group A of the Champions League, Arsenal has also managed to stay reasonably close to the summit of the Premier League — three points behind league-leaders Chelsea. 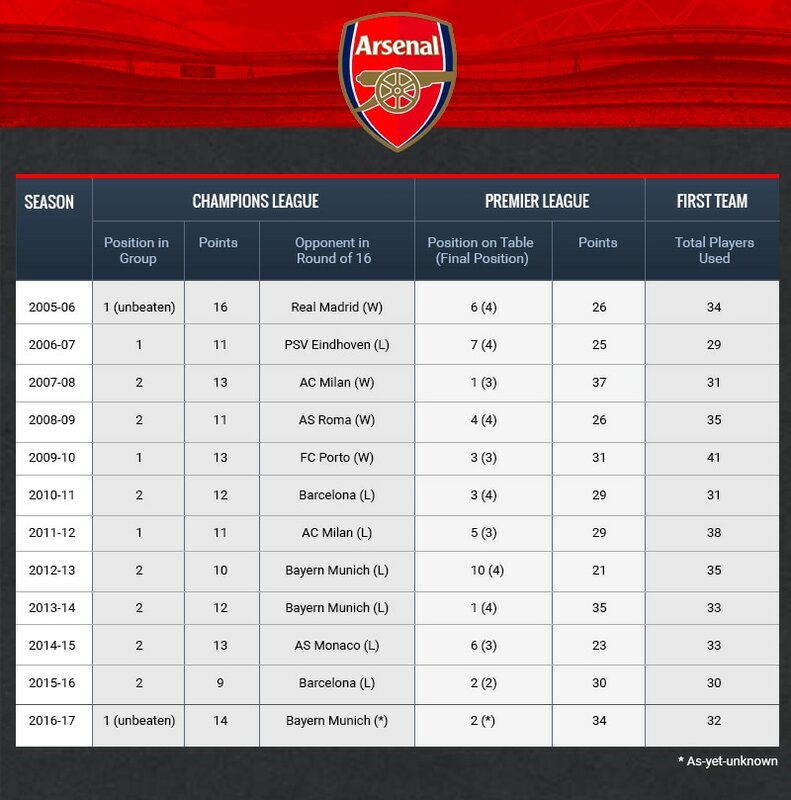 In the two seasons when Arsenal's league position at this point was better – the top of the table in 2007-08 and 2013-14 – the team had finished in second place in its Champions League group. Of course, neither the Premier League nor the Champions League is won in December. However, December does indicate a team's ability to maintain some semblance of consistency, like Arsenal has been able to this season. Losing only two games (at the time of writing, which is hours ahead of Tuesday night's Everton-Arsenal Premier League fixture) all season, the team has been able to turn losing causes into draws and draw-like situations into wins. And apart from mental toughness, resilience, team spirit and of course, the tag-team of Mesut Özil and Alexis Sanchez, one of the main reasons provided by Wenger and his players, for this run of form — as I'd mentioned at the start — is bench strength. A look back at the table above will show you that thus far, Wenger has used 32 players in his first team across all three competitions. The notion of quality bench strength suggests you have a strong enough second-string players to fill in for your first choice ones, so that you a) don't have to risk the over-deployment of certain players and b) don't need to try out too many options and take a punt on too many untested players. In the 2006-07 season, Arsenal used only 29 players — the lowest number in the past 11 seasons, while only three years later, Wenger put out 41 players — the highest number in that time frame. In both these seasons, Arsenal topped its Champions League group. However, neither of those scenarios was ideal: While one suggests an over-reliance on a handful of players, the other suggests a season marked by too much rotation, ravaged by injuries and/or one filled with experimental stand-ins. 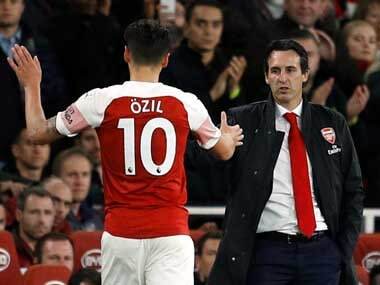 That Arsenal achieved third place in the Premier League in 2009-10 and fourth place in 2006-07 shows that the club could not sustain either model and go above and beyond the normal result of securing a Champions League berth for the following season. 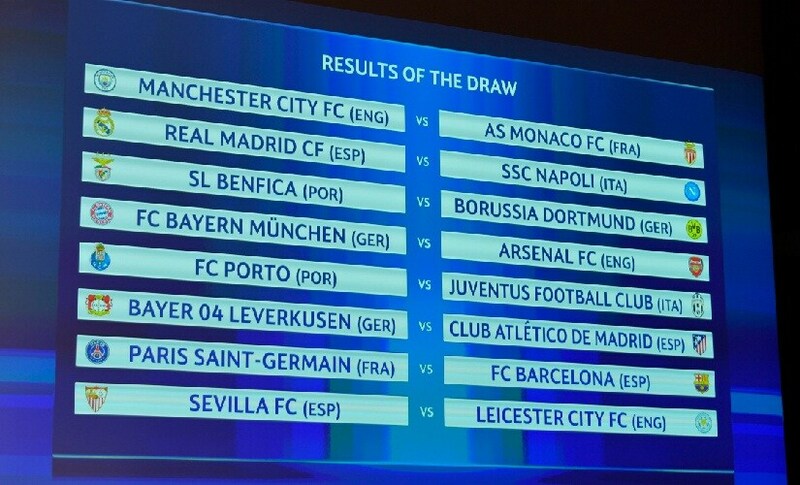 All of this brings us neatly to this season and Bayern Munich. Back in 2005-06, when Arsenal were unbeaten in the group stage and reached the final, Arsenal used 34 players over the course of the season. While I do not expect to see Arsenal dip into the transfer window this winter, the return of Danny Welbeck and possibly Per Mertesacker to the fold could see the number of players used by the Gunners this season inch closer to that figure — a nice average between the 29 and 41 discussed above. And that very obscure number is where all but one similarities end. The 2005/06 season saw the end of the Bergkamp-Henry partnership. While the non-flying Dutchman would retire at the end of the season, it would mark the peak of the Frenchman's achievements with the club. 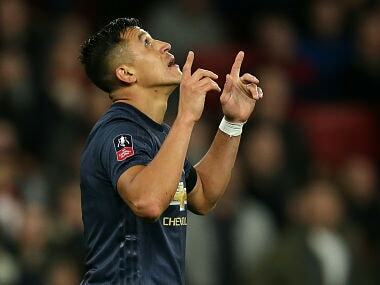 The 2016-2017 season, on the other hand, has witnessed Sanchez and Özil kickstart finally push their partnership into top gear. The 2005-06 season also saw the last few glimmers of brilliance from the likes of Fredrik Ljungberg, Lauren, Gaël Clichy, Pires and Campbell for the club. Compare that with the present season, where apart from the dynamic duo upfront, Arsenal has what finally looks like a solid back five, a vast array of central midfielders to suit every mood and fancy, and a generously-filled quiver of attacking options to suit a variety of situations and styles. And best of all, contract issues aside, all of them still appear to have reasonably long Arsenal careers ahead of them. In conjunction with individual brilliance, this is where that bench strength part has been so important – in giving players enough chances to pick up game minutes as genuine alternatives to the first choice, as opposed to being a Plan C.
And that is why I foresee that one other similarity to 2005/06 to which I'd alluded a little over 200 words ago: That time Arsenal ran through Real Madrid in the Round of 16 tie and this time, I predict the very same being done to an equally-dominant-in-this-era Bayern Munich.